In this chapter we will discuss intraventricular conduction delays (defects), which are caused by functional or anatomical defects in the components of the intraventricular conduction system. Because the conduction system is crucial for rapid and synchronized activation of the ventricles, conduction defects will typically cause abnormal ventricular activation (contraction). The significance of this will depend on the severity of the conduction defect and the affected ventricle. In general, a conduction defect in the left ventricle is more significant, as compared with a defect affecting the right ventricle. This is due to the fact that the left ventricle pumps against greater resistance and any disturbance in ventricular activation will reduce the efficiency of the pumping function. The primary ECG manifestations of conduction defects are prolonged QRS complexes and altered QRS appearance. These concepts will be discussed in detail in this and the subsequent articles. Note that the terms intranventricular conduction delay and intranventricular conduction defect are used interchangeably. The intraventricular conduction system is composed of the His-Purkinje system. More precisely this system consists of the bundle of His, the left and right bundle branch and the fascicles of the left bundle branch (Figure 1). The interventricular septum obtains Purkinje fibers from the left bundle branch. The right bundle branch does not give off any Purkinje fibers during its passage through the septum. Purkinje fibers are branched off from the right bundle branch at the level of the origin of the anterior papillary muscle. A network of Purkinje fibers sprouts out from the bundle branches an fascicles and spread through the ventricular endocardium. 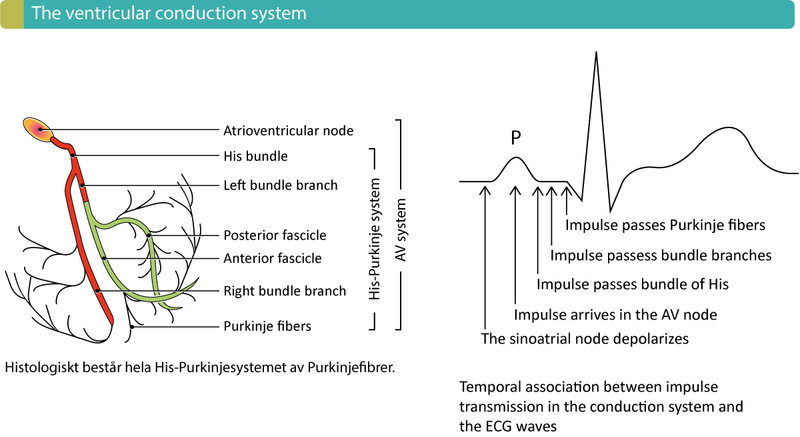 Impulse conduction through the Purkinje network is very fast (4 m/s) which enables the vast majority of ventricular myocardium to be depolarized approximately simultaneously. Figure 1 shows the components of the conduction system. Note that conduction defects in the atrioventricular (AV) node and the bundle of His have been discussed in the previous chapter. The current chapters discuss conduction defects located in the bundle branches and in the fascicles. Figure 1. Components of the ventricular conduction system and the temporal association between the ECG and impulse transmission through the heart. An intranventricular conduction delay may occur whenever any of the main components of the conduction system is dysfunctional. Widening of the QRS complex – Anatomical or functional blocks in bundle branches or fascicles may block the impulse completely. Such a block in the left bundle branch is simply referred to as left bundle branch block. The consequence of of left bundle branch block is that the left ventricle will be depolarized by impulses spreading from the right ventricle. Those impulses will spread through the right ventricle partly or entirely outside of the conduction system which will be slow and therefore cause wide QRS complex. Similarly, block in the right bundle branch causes right bundle branch block, in which the right ventricle will be depolarized by impulses spreading from the left ventricle. This will also yield a wide QRS complex. 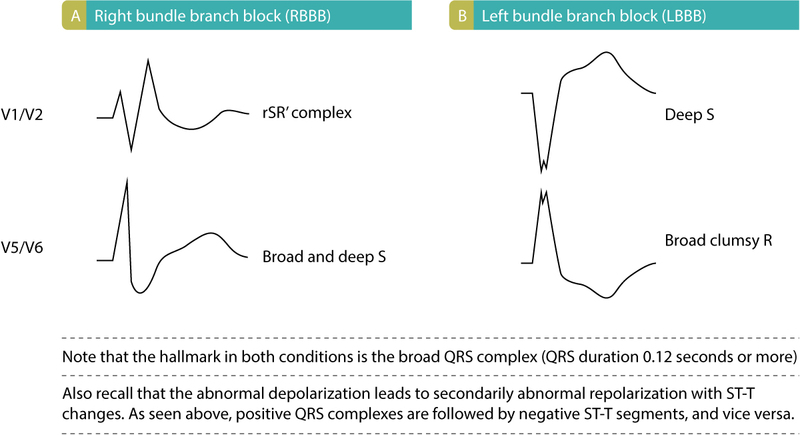 Altered QRS morphology – Because the normal sequence of depolarization is altered in bundle branch blocks and fascicular blocks, the QRS morphology will also be altered. In each of these blocks, the QRS morphology will have a characteristic appearance which makes it fairly easy to diagnose them. Altered electrical axis – Changes in the depolarization sequence may also alter the electrical vectors and thus the electrical axis. Anatomical or functional block in the left bundle branch causes left bundle branch block (LBBB). Similarly, block in the right bundle branch causes right bundle branch block (RBBB). The ventricles whose bundle branch is defect will be depolarized from impulses spreading from the opposite ventricle. This results in characteristic ECG changes depicted in Figure 2. Figure 2. Characteristics of bundle branch blocks. 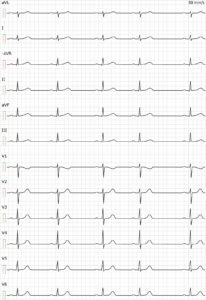 (A): ECG features of right bundle branch block (RBBB). (B): ECG features of left bundle branch block (LBBB). Right bundle branch block (Figure 2, panel A) is characterized by a second R wave (denoted R’) in V1, which gives lead V1 an rSR’ complex. In lead V6 a broad and deep S wave is noted. In left bundle branch block lead V1 shows a deep S-wave and in V6 a broad and clumsy R-wave is noted (Figure 2, panel B). Importantly, in both bundle branch blocks, the QRS duration is at least 0.12 seconds. Moreover, there are always secondary ST-T changes in these leads, such that the ST-T segment is discordant to the QRS complex (QRS and ST-T have opposite directions). 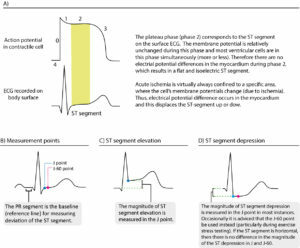 Consequently, ST-segment elevations and ST-segment depressions are expected in bundle branch blocks. Complete bundle branch blocks have QRS duration ≥0,12 seconds, while incomplete bundle branch blocks are QRS duration <0.12 seconds. However, incomplete bundle branch blocks are of significance because they tend to progress to complete blocks. Right bundle branch block in asymptomatic individuals is not correlated with adverse outcomes. On the other hand, new right bundle branch block in patients with chest pain may indicate occlusion in the left anterior descending artery. Finally, new right bundle branch block in patients experiencing dyspnea (particularly if acute) may indicate pulmonary embolism. In the vast majority of cases, however, right bundle branch block is a benign finding with little if any impact of cardiovascular prognosis. Left bundle branch block is always pathological and typically a consequence of ischemia or structural heart disease. Figure 3 gives a detailed ECG comparison of the bundle branch blocks and fascicular blocks. This image should be memorized. Figure 3. 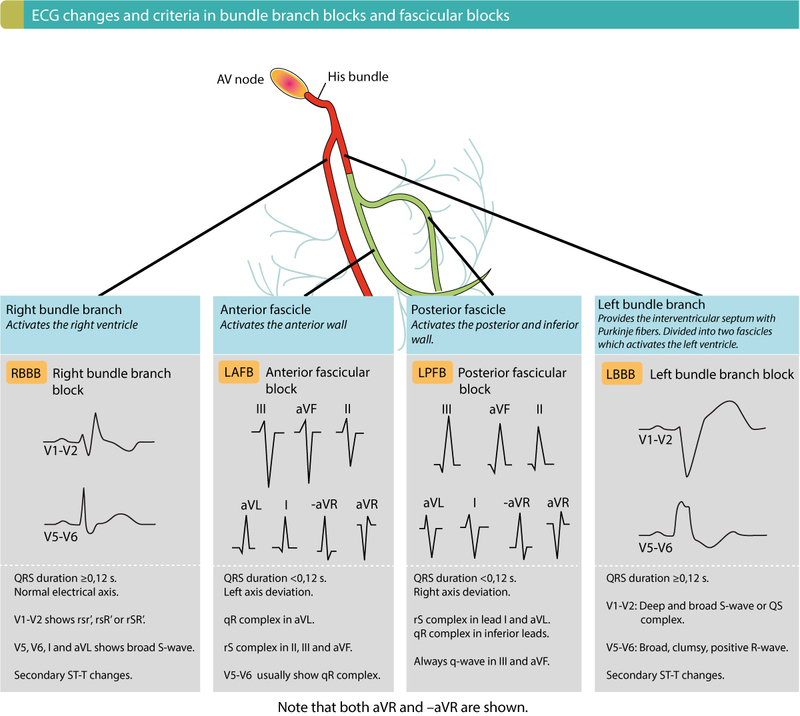 Overview of criteria and ECG changes in bundle branch blocks and fascicular blocks. All these intraventricular conduction delays are common and therefore important to recognize. Anatomical or functional block in a fascicle causes fascicular block. This was previously termed hemiblock. Block in the anterior fascicle is termed left anterior fascicular block (LAFB), and block in the posterior fascicle is termed left posterior fascicular block (LPFB). Fascicular blocks may exist isolated or concomitant with right bundle branch block. Isolated LAFB is common, whereas isolated LPFB is very uncommon. On the contrary to bundle branch blocks, fascicular blocks only cause slight prolongation of the QRS duration; it does not, however, reach ≥0,12 seconds. In other words, QRS duration in fascicular blocks is always <0.12 s unless there is concomitant bundle branch blocks. As mentioned above, fascicular block may be accompanied by right bundle branch block. This combination is termed bifascicular block. The most common bifascicular block is right bundle branch block and left anterior fascicular block (RBBB + LAFB). Left bundle branch block with simultaneous left posterior fascicular block (RBBB + LPFB) is uncommon. Simultaneous block in both fascicles (LPFB + LAFB) is equal to left bundle branch block (LBBB). This combination is rather common and it is recognized through typical RBBB pattern in V1 and V6, along with LAFB pattern in lead II, III and aVF. QRS duration is ≥0,12 seconds. Electrical axis is –45° to –120° (left axis deviation). This combination is uncommon. It may only be diagnosed in absence of right ventricular hypertrophy. Lead V1 shows RBBB pattern while lead aVL and I display LPFB pattern. QRS duration is ≥0,12 seconds. There is right axis deviation. According to MacFarlane et al (Comprehensive Electrocardiology, Springer, 2010) trifascicular block is defined as presence of a bifascicular block with simultaneous first- or second-degree AV block. However, the term trifascicular block should not be used as it causes more confusion and enlightenment. It is advised that each defect be stated separately. The term bilateral bundle branch block has also caused some confusion in the literature. According to MacFarlane et al, bilateral bundle branch block is defined as the presence of a complete bundle branch block (RBBB or LBBB) with simultaneous first- or second-degree AV-block. As for trifascicular block, this term should be avoided. Instead each defect should be described separately. The ECG may alternated between LBBB and RBBB. This carries a poor prognosis because the risk of developing third-degree AV block is high. The risk of progress to third-degree AV-block is particularly high if there is simultaneous first-degree AV block. Sporadically occurring bundle branch block is common, particularly during tachycardia (see article on aberrancy).